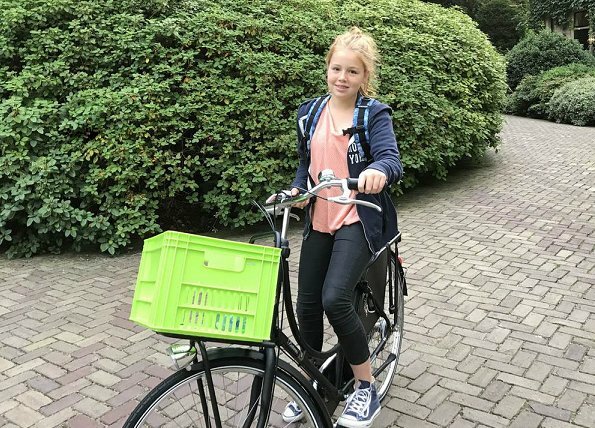 Princess Alexia started high school at the Christelijk Gymnasium Sorghvliet in The Hague. The Princess set off for school on today morning by bike, the preferred mode of transport in the country. The Dutch royal palace released a video about the Alexia's first day at school on its official Instagram account (@koninklijkhuis). Princess Alexia's elder sister Prenses Amalia started 3rd grade at the same school in this year. Very beautiful young girl. I like her practical, casual clothes for school. She looks comfortable and not a bit awkward. It does help that her Dad took the photo.